I’m among the artists creating new work for the first Estuary biennial. Metal are making it all happen, and brought together a small group of us to work alongside each other and explore Southend, Tilbury and other significant sites along the Estuary for a week. The places we saw are truly magical – real industrial edgelands with layers of use, occupation and meaning. Places at the end and the beginning of so many English stories. Making it an incredible commission; a chance to weave together all sorts of fragments, places, moments in time. Can I live up to all the possibility? We’ll see. As I sit here, I can see the full spread of the Thames Estuary; the Isle of Grain, wind farms, the sea forts, the constant tides and changing shipping. At night, Southend sparkles on the horizon. I live eight floors up in Arlington House, Margate, big aluminium-framed windows facing down the estuary. In winter I huddle down and watch storms build and move along the shore, and in summer slide the windows right back to let in warm sun and the sounds of play. The estuary’s an impressive space. Where I was born, the sea is on the south and is somehow smaller. The sea and sky here is huge. And this view is one which is full of stories, as well as surrounded by estuary-side towns with their own tales. Submarines and pirate radio, independent nation states and messages in bottles, migrant seabirds and immigrant communities, containers full of Chinese-made knick-knacks, the rusted skeletons of crashed Zeppelins, the last flight of a Vulcan A-bomber. There is no individual act in performing arts that does not require collective effort to be realised. 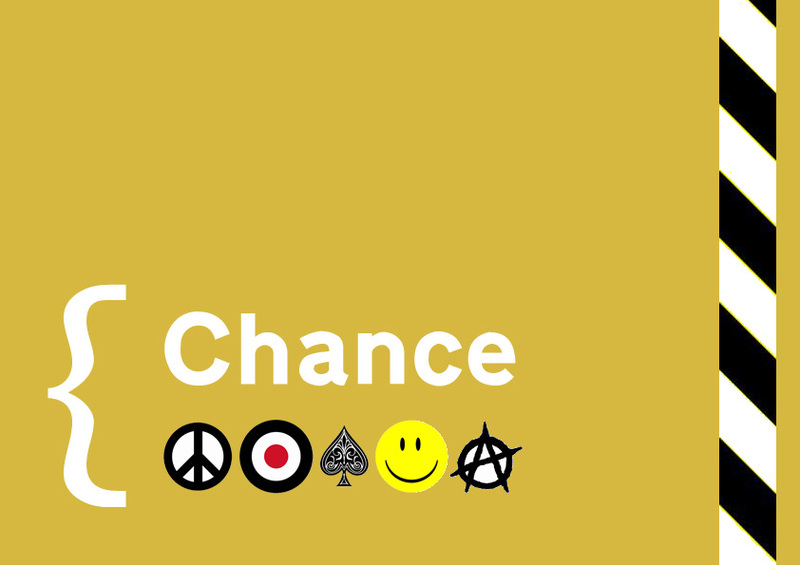 Together each individual element, be it the artist, producer, venue manager or facilitator, forms a collective experience for our sector, and our wider society. Too often the “Them and Us” distinctions we draw can become entrenched and hostile. This conference, will look at these perceived boundaries through a variety of lenses – exploring the separation of artist from state, distinctions between makers and audiences, performance spaces and communities, the “established” and “emerging”. Do common issues and concerns arise? Are there shared approaches that could be more fruitful? What is our single and collective responsibility? There are plenty of opportunities to talk, and in my time I’ve covered leadership styles for multinationals, digital strategies for social action, grassroots regeneration of town centres and everything inbetween. In June, I’m travelling to Galway for the All-Ireland Performing Arts Conference (APAC) to talk about the performing arts need individuals and a collective effort. It’s a subject that I find very interesting, particularly as theatre (where my career started) offers such a different approach to the visual arts, which hold up the myth of the individual as the artistic genius. I was standing on the waterfront in Newcastle, NSW a few years ago talking to a bunch of interesting people after a conference (Marcus Westbury, the Renew Newcastle gang, the great people from Gap Filler in New Zealand) – and we realised that all of us, and the people we admired who were taking creative collaborative approaches to urban renewal, had a thread of theatre in our backgrounds. And it’s an approach I’ve applied to 15 years of working with mostly visual artists. I am beginning to realise that the lines between the different elements of my practice, between performance and design and visual arts and regeneration and urbanism and social action, are very thin. Perhaps, in a dozen universes that are just a subtle knife cut apart, I have different job titles; artist, writer, activist, producer, urbanist. For my talk at APAC, I’ll try to tie them all together. Fifteen years ago, the National Front marched in Margate. The end of the 20th Century was much like the start, and refugees were fleeing from war in Europe. Arriving in Britain, they were met by fear, hostility, anger and lies. The Jews, fleeing Germany and Eastern Europe in the 1930s, had received a similar welcome in British seaside towns. Oswald Mosley’s Blackshirts paraded in Worthing in the mid-1930s, and the National Front continued the tradition in Margate 65 years later. Some things never change; perhaps racism runs through seaside towns like letters run through seaside rock. As the 21st Century begun, the Isle of Thanet was home to only about 3000 asylum seekers, most living in Margate. They were fleeing from something real. A local doctor reported treating “shrapnel wounds, scars from beatings and torture, wounds from landmines” and the psychological problems associated with such injuries. The people he was treating included doctors, ex-army officers, dentists and teachers. Many were Kosovans, in England to escape death at the hands of the Serbs. Once here, they were met with open hostility by people who lived in a largely closed, settled community, unused to foreigners, and which was struggling with its own problems. The local industry, a tourist trade which had started in the 1700s, had collapsed. Thanet’s people had always had low incomes, uncertain jobs, and seasonal employment but, by 2000, things had reached a low point. Boarding houses were filled with Londoners, resettled by local authorities who had run out of space in the capital. These new residents often brought their own problems, which were only increased by unfamiliar surroundings and social isolation. And the relationships London’s local authorities had made with landlords in Margate, meant they could use the town to house their refugees, too. Once grand hotels like the Nayland Rock, and the larger, prouder guesthouses in Cliftonville, were just empty spaces to council officers. Seaside landladies saw a quick buck, and either filled their vacancies or sold up to London councils. Kosovans didn’t choose to come to Margate; they were sent here. Of course, asylum seekers never did take over. In 2015, just 8.59%of the population in Thanet were born outside of the country. The national average is 12.5%, London has 37%, and even in sleepy, middle class Canterbury 10.96% of the population were born abroad. In Thanet today, 11,599 people out of a population of 134,186 were born outside the UK. 3500 are from new EU member states, such as Croatia, Latvia and Poland, and 3700 from the old EU states, such as Belgium, France and Italy. 4300 people are from outside the EU. Very few are from Kosovo. Playwright John Retallack wrote Hannah and Hanna, about a 16 year old Margate girl meeting a Kosovan girl and forming a friendship across hostile lines, in 2000. The founder of Actors’ Touring Company, a director of the Oxford Stage Company, Retallack is particularly interested in theatre for and about young audiences. He’s written a dozen plays for young people, and has recently spent two months with La Chartreuse de Neuville in France, researching the lives of young refugees in the notorious camps in Calais. Returning to Margate in 2015 to write a sequel , Hannah and Hanna in Dreamland, to his earlier play, he struggled to find any Kosovans to talk to. He journeyed instead to Pristina, the capital of Kosovo, to find that most people had returned there, after the war. 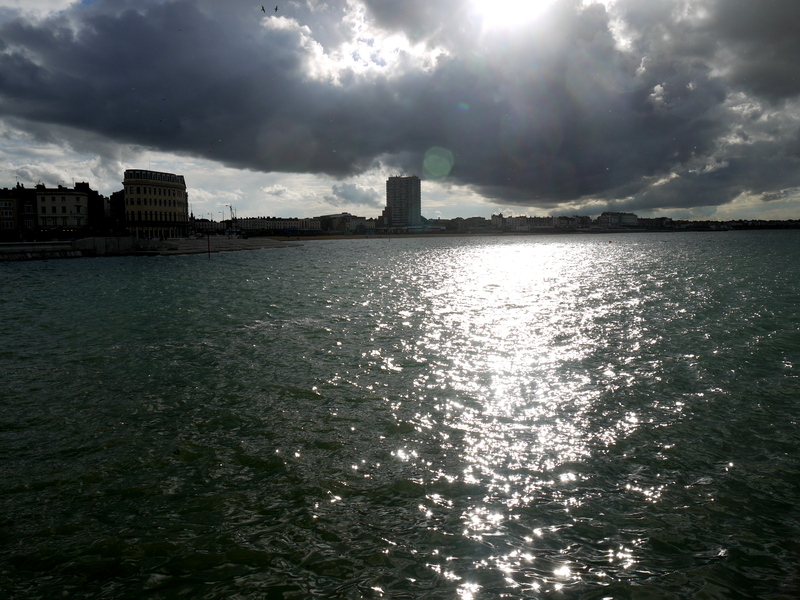 He found a city with a hard past enjoying a rebirth that, in some ways, mirrored Margate’s own. Margate today has a growing tourist trade. The new visitors are here for Turner Contemporary, the Old Town’s vintage shops and cupcake cafes, and the Hemingway-branded Dreamland, where ‘heritage’ is a dirty word but ‘retro’ or ‘vintage’ are perfectly acceptable. The town is the hippest destination for London’s cool under 40s, and is in the middle of a property bubble as people relocate here, swapping East End flats for big seaside homes as they start families. This new crowd, known locally as DFLs (Down From Londons) , experience a lesser version of the anger the Kosovans experienced before. There are fears of gentrification, of rising property prices, of the new ideas these economic migrants bring with them. And there’s still a racist tension underneath everyday life too, still a fear that the town’s somehow being taken over, and it’s most evident among a slightly older generation, who saw their town’s fall, and are still looking for someone to blame. And a younger generation have inherited that anger. The teenager quoted in the Thanet Gazette has gone from “I am not a racist person…” to having a pitbull tattooed on his chest, and giving his support on Facebook to pages like the English Defence League, True British Patriots, English and Proud, the Royal England Infidel and one called ‘I Was Born In The Uk. So Why Do I Have Less Rights Then Immigrants’ [sic]. UKIP tried to capitalise on this cross-generational anger in the elections in 2015. Throwing everything they could at the Isle of Thanet, swinging a well-funded party campaign into action, UKIP booked every billboard for months, filled hotels with their campaign teams, and pushed leaflets through every letterbox every week. They failed to get their prospective MP Nigel Farage elected. The party collapsed into bitter infighting soon after. 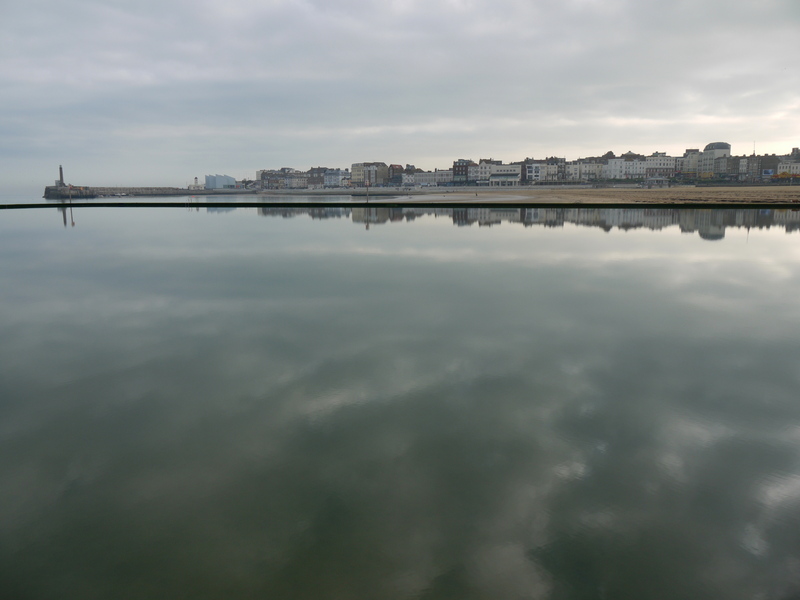 So while many things in Margate are the same, 15 years on, there are great differences too. Hannah’s still friends with Hanna, but it’s a different world they live in. Margate’s new London incomers are more used to a multicultural society, and the town’s relaxing into the 21st century. Retallack’s new play might find that perhaps, just perhaps, it’s possible to change the letters in a stick of rock. There will be a rehearsed reading of excerpts from Hannah and Hanna and Hannah and Hanna In Dreamland at Turner Contemporary as part of Looping The Loop. The event is organised by UK Art International and Theatre Royal Margate. Hannah and Hanna In Margate is an ongoing photographic series by Dan Thompson, capturing Retallack in Margate, as he researches, writes and tests the new play ahead of a UK tour in 2017. It will be exhibited alongside the rehearsed reading at Turner Contemporary before accompanying the show on tour in 2017. I have been interested in the rise of these images on social media; often, people who would be proudly anti-war usually, post photos of women at war with some pride. As if war is somehow better, now that women have guns, too. All of these are images found on social media. I’m interested in the way they’re spread, without any context. Are these the good guys or the bad guys? Up at the top of England, sceptred isle, just below the border with Scotland, in a corner that’s always been on the edge and often in a state of flux, is Eden, demi-paradise. Eden district is full of places that sound incredibly English – Appleby, Crosby Ravensworth, Eamont, Greystoke, Morland, Ravenstonedale. But also of places that sound older, Celtic, Viking, Scottish – Hesket, Kirkby Stephen, Kirkoswald, Langwathby, Shap, and Penrith itself. Eden has less land taken up by roads than almost anywhere in England (and it claims, probably falsely, that John McAdam, inventor of the tarmac road, lived here). And – at 97.9% – Eden has the greatest proportion of green space of any district in the country. The River Eden flows north to Carlisle. In Penrith, the River Eamont, River Lowther, River Petteril, Thacka Beck and Dog Beck come together. Engineer Joseph Locke casually diverted one of the rivers when he spent two and a half years with ten thousand men driving a railway line through Penrith. Penrith is a market town, on an old Roman road. It’s a quiet centrepoint. Richard III, William Wordsworth’s mother, Samuel Plimsoll, Harold Wilson’s wife, and England cricketer Paul Nixon lived in Penrith. Perhaps King Arthur did too. Perhaps fifty of Arthur’s knights gathered at Eamont, on the southern edge of Penrith, to fight for the hand of Arthur’s daughter. Perhaps. Certainly more important than a mythical king and a lark’s nest, though, is the story of Athelstan. In 927, “the kings of Strathclyde and Scotland came south to Penrith to pay homage to Athelstan, first King of England and one of the greatest Anglo-Saxon kings.” Penrith is where England began, with Athelstan the first king of the whole country. And in Penrith, you’ll find Eden Arts. Since the start of the 1990s, they’ve been fighting a quieter battle to bring art to the area, never needing to kill anyone to achieve their aims. They’re the most rural of all the arts organisations that Arts Council England supports as part of its National Portfolio. They helped make the Eden Benchmarks, a series of carved stone sculptures which also function as seats, on public paths along the River Eden. They helped bring Andy Goldsworthy to the valley, to make drystone wall Sheepfolds. They marked the hill farmer’s ancient and enduring relationship with the upper Eden Valley with a Poetry Path, carved in Stone. They left a fifty ton megalith between the ancient earthwork known as King Arthur’s Round Table and the nearby Mayburgh Henge, to mark the millennium. Nowadays, they march to a different drum, more interested in people and the life they bring to places than in heavy stone markers. 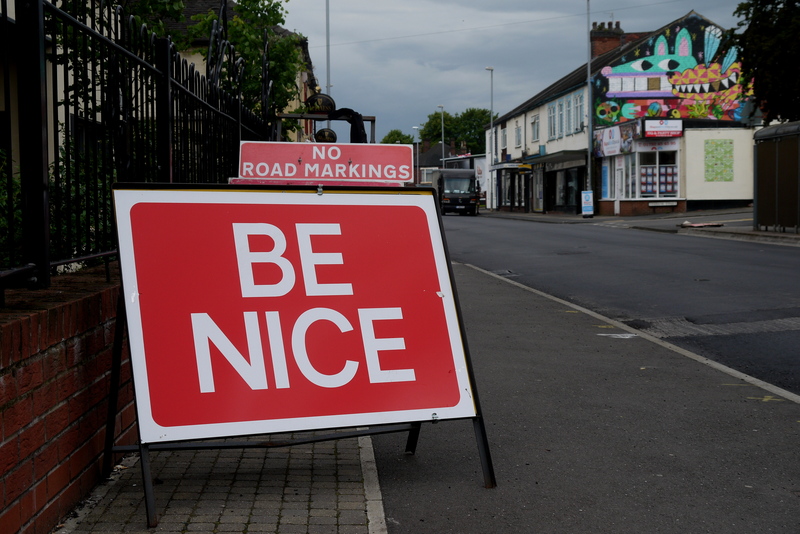 Eden Arts made the Signs of Penrith, a series of small, temporary signs scattered therough the town’s streets, local stories, things that made the place distinct, light and not outwardly serious. They organise C-Art, a festival spread across Cumbria, when artists open their homes and studios. C-Art also organises an annual exhibition celebrating the best contemporary visual art from the region, and an award for young Cumbrian artists. Picnic Cinema brings open-air screenings to forests and other quiet places across the area; a regular event is the Withnail Weekender, screening the cult film Withnail & I at the remote location, Sleddale Hall, where its heroes holiday. When they’re not outside, Eden Arts tour their film equipment to rural village halls, allowing local people to stage their own film screenings. New Writing Cumbria covers the whole county, too, with a network of live events, publications and workshops connecting contemporary writers and readers. And the Winter Droving is an annual event, a brand new tradition, fresh thinking wrapped up in a fake mythology, a revival of an ancient thing that never happened before. It’s a day-long party in Penrith. The beautiful town centre, red stone buildings and old market places, is blissfully closed to traffic. A market mixes fresh food and odd art projects. Strange characters walk the streets. The district’s toughest compete for the Drover’s Cup, tug o’ war and running with pints and carrying baled hay. Small stages, bands from the blurred edges of folk tradition and crusty, festival culture. Fire. A torchlit procession as the sun falls, giant paper lanterns carried by local children. Masks. And an anarchic ball in the local leisure centre to end it all, live bands and masked mayhem. It’s all about place, everything Eden Arts does and has ever done. It’s all about creating something locally distinct, tied to the history, culture and fabric of the landscape. In an urban context, it’d be the hippest thing London or Manchester or Brighton ever saw. Up here, on the edge, it might be missed. But that doesn’t mean it’s any less important. What didn’t work. In the spirit I always talk about, that discussing failure’s important, here are the bits I want to improve for future (and a rider to this – this is my personal list, not a detailed evaluation, and it’s thrown up quickly). Some of these are very local but are things to watch out for if the game goes elsewhere. You must read yesterday’s post about what worked alongside this one. The least used check in was the one inside Dreamland. While the Roller Disco and The Quarterdeck were well used, players didn’t get inside Dreamland, and we didn’t turn the people who were visiting Dreamland into players. We had Dreamland staff playing, but even they didn’t check in inside the park (even though they did go to other venues). If TribevTribe happens in big places, it needs a bigger presence. When staff from Dreamland and Turner Contemporary were playing, we could have made more of getting them to play against each other than we did. In week one and two, we kept them competitive, but it would have been good to have encouraged the organisations themselves to push this more internally. I had hoped this would create a game within the game. We didn’t use our players as the mechanism to get new people playing enough. We know this could work, and a few times it did, but we should have pushed it harder. We got some people Tweeting, using Instagram and watching the Facebook page, but we never took it further. We didn’t have the time or budget to fix the mechanics for people who wanted to play entirely online. An app overlaid on the real world game would be a good way to take this further, but you still need the real, physical game. Could the further away players encourage, mobilise, act as back room teams for the players locally? We needed this version of the game to work out how a more online version could work, though; it was like a big card sorting exercise. We didn’t add as many new check ins as we could have, mainly because I ran out of bits to make them! It would be good to have the time to mass produce log books, Chance cards and so on. To be more responsive, to add new check ins quickly. 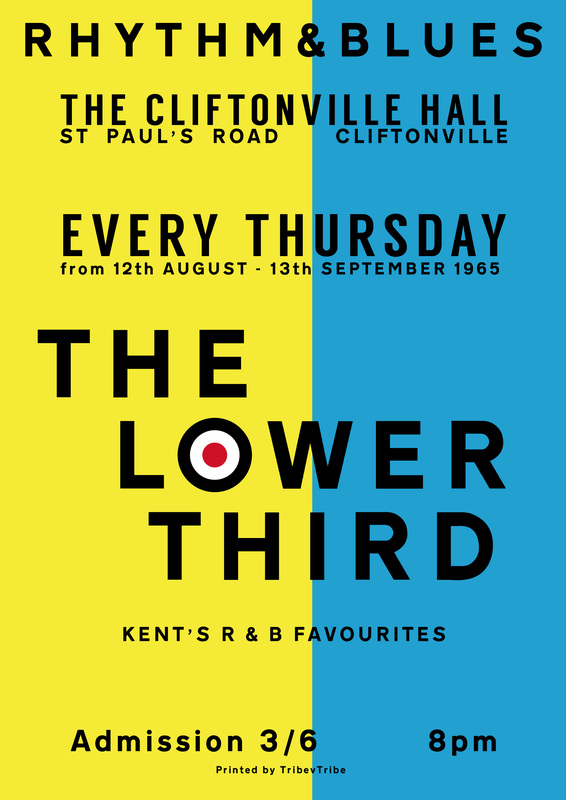 Some people ignored TribevTribe, and I felt that while it’s good that Cliftonville is developing its own identity, it was perhaps too separate. Visitors don’t care whether it’s Margate or Cliftonville, and could be encouraged to move around more. We tried to get Resort on the board, and the Tribes Festival was run from the Tom Thumb Theatre, but we didn’t nail either to involvement in the game. Venues in the Old Town and the lower High Street were more enthusiastic. How can we create something which drives visitors to Cliftonville, if Cliftonville doesn’t want to join up with what’s happening elsewhere? We made lots of good links, connections, and moved people to new places, but not in this case. With a bigger production team, we could have got check ins set up at some of the events happening around Margate too. We tried to get a check in at the Art Car Boot, for example, but didn’t get it sorted until very late so it didn’t happen. Again the short timescale we worked to made this harder. I think 6. and 7. show where we could have done with a little bit of help. TribevTribe played across some of the venues involved in the Tribes Festival, but a little bit of nudging other places from the Tribes Festival organisers might have meant we had check ins at more venues and events. I understand the budget and time constraints, but think future festivals need a bit of active curation to encourage collaboration. The space between exhibitions, events – the bit that TribevTribe occupied – the bit where audiences can find new experiences, move from thing to thing – is important. We need to develop audiences, get new people to see things, and make it easy for people who already see some things to try new ones. To make sure events, actions, happenings, dovetail. Our final week was the quietest, although it did swing the final results. It was after the school holidays, and after a big burst of activity in Margate, so there were fewer visitors in town, and fewer residents out around Margate as well. There were fewer check ins, but this allowed the Mods to play tactically, take places, and win the game. We could have pushed extra places, extra rewards more this week. So after 30 odd days, TribevTribe v0.1 has finished. Game Over. What worked well? People played together. Families; we saw mother, daughter, and grandma playing together a couple of times. Was TribevTribe mostly played by women? Seems so, though that’s not data we recorded. Friends; we saw small groups trying to outplay each other, too. On different sides. People played as much or as little as they wanted. Some people tried to visit every venue, some tried to find every badge, some played for the whole month, getting tactical towards the end. Some people dipped in for a day, on a daytrip, down from London or on a day off work. People found new places, or found that TribevTribe gave them an excuse to go to places they wouldn’t normally go. Richard said he’d found the Shell Grotto by playing, and a couple said they’d had their first pints in The Quarterdeck when they went there to play. All the stuff looked good. People liked the Dead Letter Boxes, log books and Chance cards. The mix of designed but homemade appealed; the lo-fi, some people said, made the game feel a bit edgy and underground. People nicked bits of the game to take home and keep. We let the Big Boys mess around. We hijacked a locker at Turner Contemporary and hid stuff in Dreamland. At both venues, staff seemed to enjoy the oddness, and were obviously excited or amused by players turning up. They delighted in making grown-ups say a silly password to get the Dead Letter Box. The history stuff got people talking. Places displaying posters for old gigs had conversations with their customers about those gigs, about memories, about what went before. People weren’t sure what was real, what was made up. Lines blurred. That and the Chance cards made people look a little harder, linger, even go back to find things they’d missed. People added bits, Children left drawings in Dead Letter Boxes. Other people added sweets. The boxes looked after themselves, or rather – people looked after them. Nothing went missing, nobody stole all the badges. We made things equal. Turner Contemporary got the same from the game as Breuer & Dawson, Rat Race was as important as Dreamland. 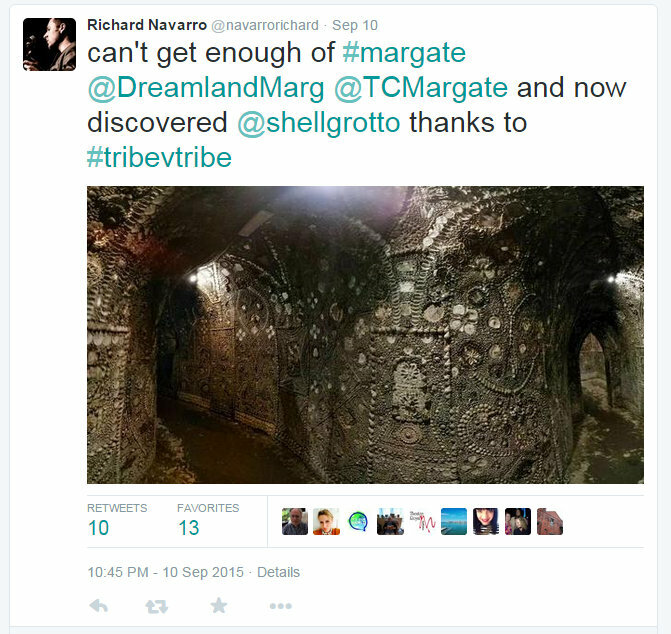 Old places like The Shell Grotto were on the same level as new places like the Street Art Boutique. Players could cheat. Well, they described it as cheating; I think they hacked the game. Found ways to visit more places, found stooges to take their place for a day to score more, found ways to sign other people up for their team. It was a game that belonged to the players, not the referees. The Tribes Festival felt bigger because of the game. We took in more players, added a layer, got the places we were using talking about each other and about the game. TribevTribe was an effective amplifier. Bolting on things like the Wide Eyed Theatre workshop added layers to the game – even if that workshop had a low signup. Perhaps those things need a bit more integration to really work. We opened up Marine Studios. This place is a brilliant space. It’s got room for bumbling artists and anarchic thinkers, even while the main resident company are stretching themselves on a big pitch to an overseas client. More people came in, saw the place, and signed up as coworkers. The building, the space, was adaptable, agile, hackable and professional. We gave something back to the space by being there, too. It made me think, to look at my own work differently, to see a new angle on what I’d been doing for years. It was all done cheap, fast and dirty. We had about three weeks from the Green Light to having people playing. The budget covered a few days work, but people gave lots more because they were enjoying it. As well as TribevTribe, other work was made. Megan the producer made a series of drawings of the places in the game, and there will be more work for her from that. David joined us on work experience, shot a great bunch of pictures for his portfolio, was forced out of his comfort zone and got an exhibition. All that and it’s all only beta, test, trial, This version of TribevTribe is just the start. Imagine it with a budget and time. Five tribes will fight across Margate for the next month. 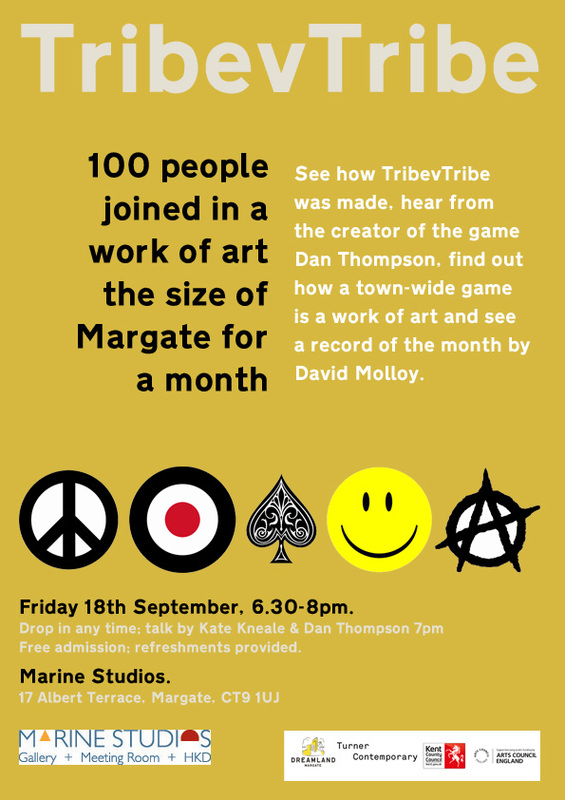 TribevTribe is a month-long artwork which takes the centre of Margate as a board to play on. When players choose to play they collect a Game Card, which randomly assigns them to one of five Tribes – Mods, Rockers, Punks, Hippies and Ravers. So if up to five people decide to play together, they’ll be playing for different teams. Players visit venues across Margate, looking for a hidden Dead Letter Box. Usually taking the form of a wooden box, the Dead Letter Box is identified by some combination of the five Tribe symbols. Players can visit each venue once a week. In a few places, the Dead Letter Box is held by staff, and there’s a password to access it; the clue to these stashes can be found in other Dead Letter Boxes. Every Dead Letter Box contains two things for sure; a Log Book and a pack of Chance cards. Players record that they’ve visited to score a point, and take a Chance card which can send them to other venues or set them another task to score more points. Dead Letter Boxes might also contain rewards or gifts left by other players. These might change week to week, and special rewards might be announced via social media. Players can play by themselves, in secret; they can just visit each venue, find the Dead Letter Box and record their visit. The game is like a less technological version of geocaching. It’s a good way to explore Margate. Or players can choose to play TribevTribe on a more social level. Players don’t know who else is on their team, but can accept Chance card challenges to use social media to meet other players. Or they can, by gathering strangers together (and without even meeting them) play strategically, agreeing to all visit certain venues in an attempt to conquer them. That’s important because scores are collected from the Dead Letter Boxes, and announced on a rolling basis. Each week, it will be announced which Tribe has scored most points and conquered each venue, encouraging the other teams to try to retake those places on the board. Around twenty venues are involved in the work. Each venue can choose how to participate; the simplest way is just to host a Dead Letter Box. But some venues have chosen to get their staff playing, to add extra levels of content, or to champion one of the five Tribes on social media. The first fifteen venues are already in play – and more will be added next week. The venues are large, big public funded attractions like Turner Contemporary, and small, independent shops, cafes and attractions like The Shell Grotto, Rat Race and Proper Coffee. Other venues are involved in another way. The game’s skin of subcultures has led to the creation of a series of posters referencing real gigs and events from Margate’s past; a residency in a community hall for The Lower Third, a Hawkwind community benefit, a wrestling match and so on. 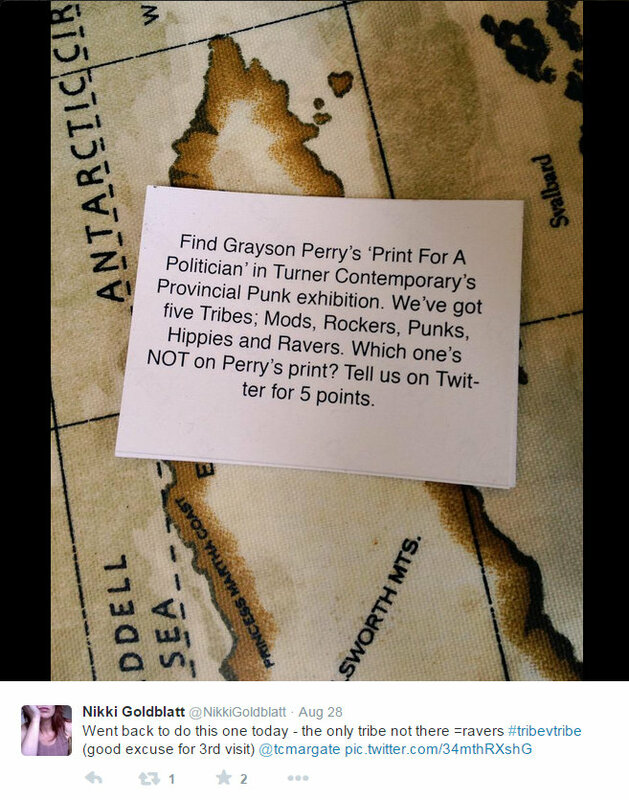 These post for long-gone gigs can be found displayed around the town, and players score extra points for finding them, too. The game is designed to scale, flex and adapt as it happens; ‘it’s iterative design’, a Design Council expert said as she took her Game Card. TribevTribe was conceived after carrying out evaluation of last year’s Summer of Colour, a festival organised by Turner Contemporary. That evaluation found that people’s movement across Margate from venue to venue was limited. And that people weren’t generally attending multiple events within the festival. TribevTribe aims to address that, by giving people an incentive to move between places. But it also creates a linking structure for the diverse venues within the festival, and connects them to smaller independent shops, cafes and attractions across the town. Whenever you go down the roads in Britain, you travel not in three dimensions, but in four. The fourth dimension is the past. And as we move to and fro in this fourth dimension, we see not only landscape but the economic, political and social forces at work behind the landscape. Shaping it, forever changing it, but leaving here and there the record, and the mark. There’s life everywhere and the tracks we make are shared and crossed by the paths of others, who know this world better than we do. TribevTribe is a game uses the town itself as the board, and is played not in three dimensions, but in four. It’s a game which celebrates Margate’s place as a home to youth culture, and lays that past over the present townscape. Players move through the town, and in and out of history, winning points by completing simple challenges, finding clues or building their tribe. As they play they win points for their tribe; Mods, Rockers, Hippies, Punk and Ravers. The Isle of Thanet, which history tells us is the correct place to land if you want to conquer Britain, will be conquered again as each tribe wins and loses territory in the four weeks the game is being played. 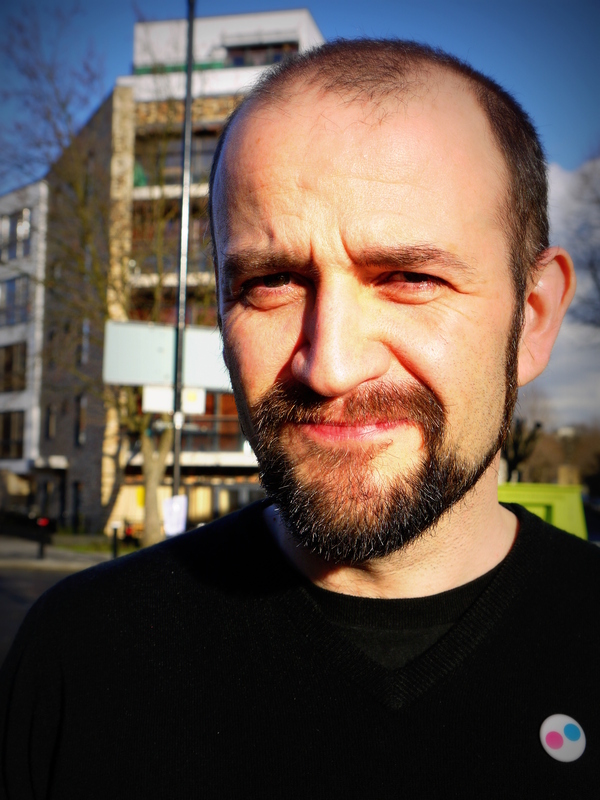 TribevTribe has been created by Dan Thompson, a social artist whose work is about mapping, public space, towns as places to play, and social history. It’s been commissioned by Marine Studios, who are behind the GEEK festival, which brings play, art and technology together. It forms part of the Tribes Festival. TribevTribe is funded by Kent County Council and the Tribes Festival. Margate’s beautiful Main Sands is bookended by two Brutal buildings, bold seaside architecture that is the spirit of a town that’s on the edge, both physically and metaphorically, told in concrete. 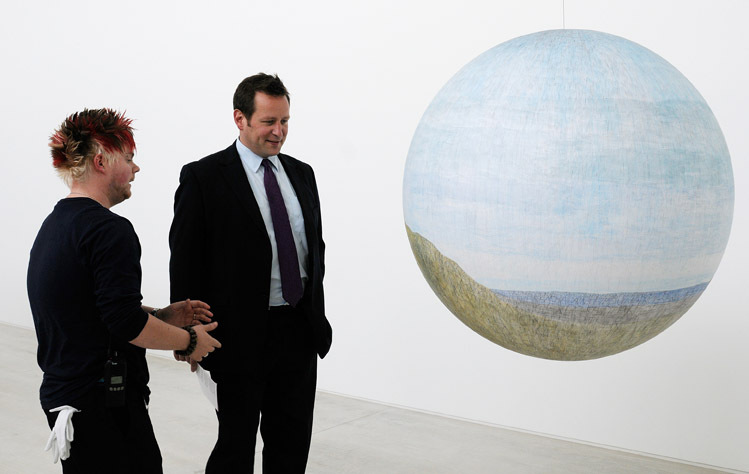 Turner Contemporary and Arlington House are a pair, a duet, Margate’s story made solid. Because Margate’s a living, breathing place. It’s not pickled heritage painted in Farrow & Ball, not a Cath Kidston nod to a Ladybird book past, not a 21st century take on a kitsch saucy seaside postcard, but is a colourful, chaotic and always contemporary place. It’s always faced firmly forward and Arlington House is as much part of that story as the Georgian squares, Dreamland’s Art Deco cinema, David Chipperfield’s Turner blocks or the crazy Clocktower. And right now, Arlington House is the bit that’s been left behind. From the tower’s east-facing flats, you can see Turner Contemporary and watch Dreamland coming back to life. And Arlington has to be next. The site has been in limbo, since Tesco pulled out, and worryingly there’s still planning permission for demolition of the shops, car park and the tower’s elegant 60s-styled foyer block. So we need to fight. When it was first proposed Turner Contemporary was a crazy idea, and when residents stood up for Dreamland they were told it was never going to happen. Except – Turner’s there, and Dreamland is. By getting together, Margate’s residents and visitors have shown, big things can be made to happen. Arlington’s next. Tell everyone, Arlington’s next. So right now, we need to get some cash into the Friends of Arlington House accounts, to pay off some of the legal costs from a long fight to save the building and to give them a fighting fund to look ahead. Like I said, it’s Margate’s residents and visitors that will make things happen; and they’ve donated some frankly (and yes, the word’s overused, but trust me – it fits) awesome lots to a fundraising auction. So – would you like some art or Wayne Hemingway’s autograph, some coasters or some cushions? Advice on making your home, garden or just your body a bit better? Would you like food, or drink, in one of Margate’s ace eateries? A stay in a boutique b&b, an Old Town apartment or in a flat in Arlington House itself? 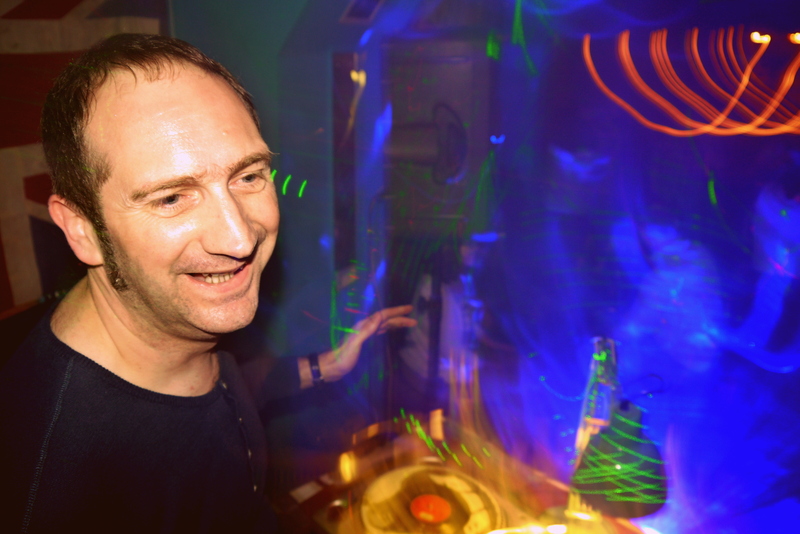 Would you like records from a frankly rather hip label, or would you like to learn to DJ with them? The Arlington House Auction is odd and inspiring, eclectic and entertaining, and packed full of stuff which I re kon you’ll love and which will help Friends of Arlington Margate keep fighting for this national treasure. Fifty-odd fab lots – bid here in the Arlington House Auction. The auction closes tomorrow at 5pm. Great theatre gets inside you, and leaves its shadows across the world when you look at it afterwards. David Glass Ensemble’s production of Gormenghast, which I probably saw more than 20 years ago, had that effect. The world looked different afterwards. Darker, more shadowed, layered. It still does. Theatre De Complicite did the same to me. So did the work of Bruce Gilchrist. When I watched the preview of Clod Ensemble’s new show The Red Chair, I had a similar feeling. Like David Glass Ensemble and Complicite, the show conjures a dark, twisted world and tells a long tale on stage. But while David Glass and Complicite rely on a whole company, The Red Chair creates that intensity with just one actor on stage. Sarah Cameron wrote The Red Chair and performs it. It’s two hours long. It’s an intense, physical experience, for her and for the audience – there’s no interval, no respite. Cameron makes a decaying household from words and once she’s created that place she tells the story of a man who eats and eats until he becomes swallowed by the chair he was sitting in, and the story of his wife who feeds him, and the story of their forgotten child. She drags you through a Grim(ms) Fairytale, full of lush lyrical language and tumbling poetry. Follow Dan Thompson’s board Red Chair on Pinterest. The set doesn’t: it’s just Cameron, a chalk circle to contain the things she conjures, and a wooden chair. There’s a shot of whisky and some chocolate for the audience. They only reinforce the sense that this is some dark mass, some strange ritual. The Red Chair is coming to Margate. Go, and I promise you won’t ever forget it. Here’s some of 2014’s design work for Margate’s The Black Cat. Stoke’s London Road connects the buzzing, active communities of Boothen, West End and Oakhill to the town centre along a long, straight road that’s full of history, unusual buildings, old architectural features and public spaces waiting to be brought to life. This year-long artwork commissioned by Appetite will end in the publication of a book. 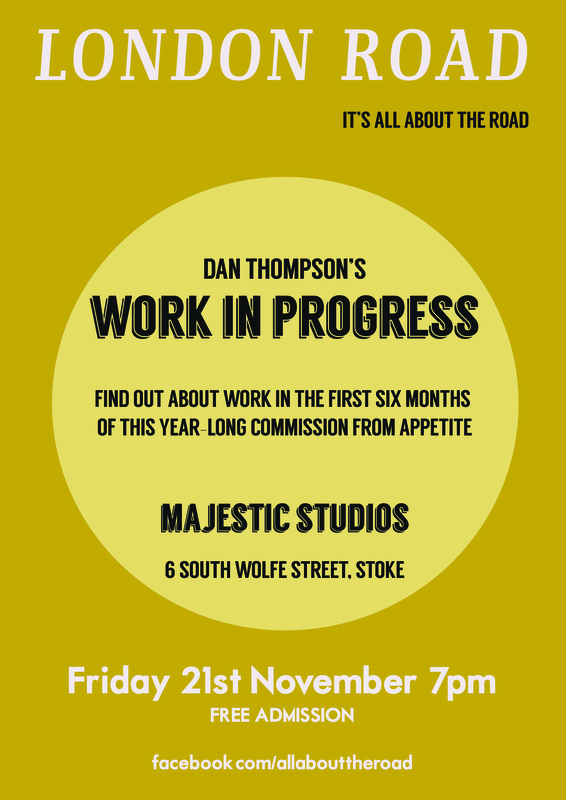 This will be a psychogeographical, slightly fictional telling of the story of London Road, from one end to the other, from the Roman to the modern day. Buildings and street scenes – general photographs from London Road. London Road – a Walking Tour – takes you from one end of the road to another. An archive of a Tweeted tour. London Road as a green belt – is Stoke the greenest city in England? 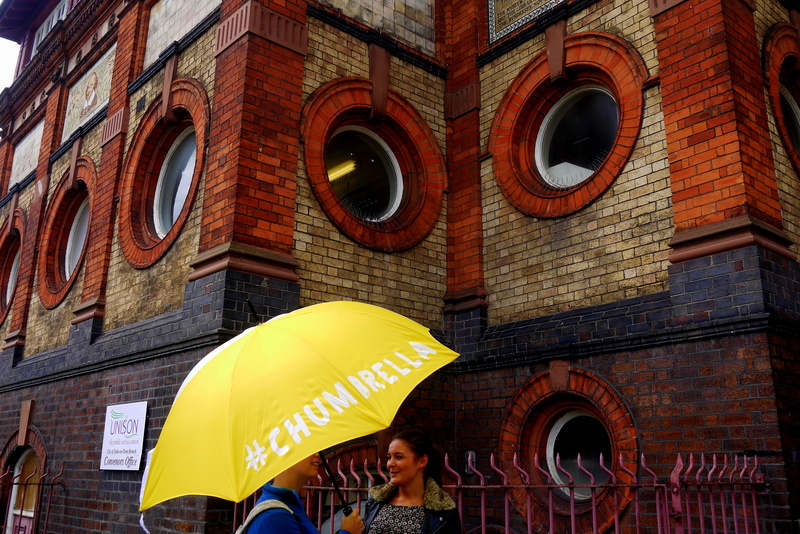 #chumbrella on London Road – an artwork by Sarah Nadin, commissioned by the London Road project and Appetite. The abandoned London Road Library – inside a forgotten building, sold at auction in 2014 for £128,000. 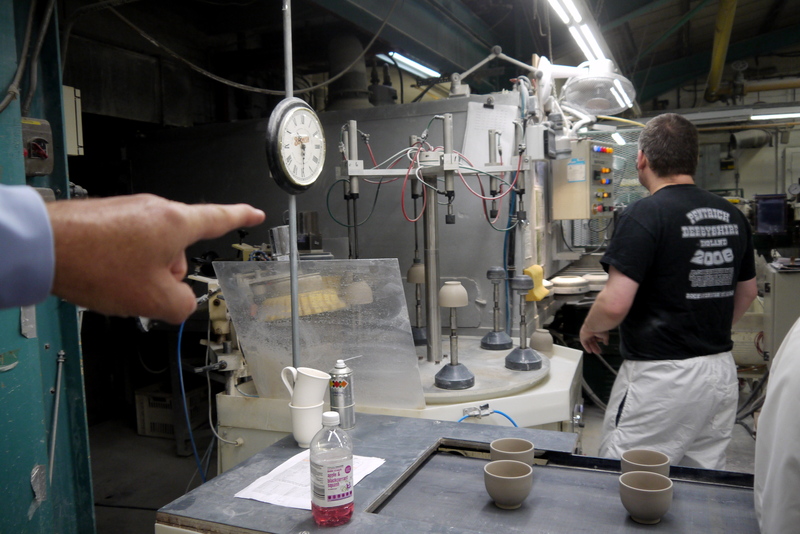 Inside Portmeirion Pottery – a successful pottery, producing 150,000 pieces of best-grade pottery every week. Inside Middleport Pottery – a working Victorian pottery, restored by the Prince’s Regeneration Trust and making Burleigh ware. London Road Festival 2014 – a community-run festival, where the London Road project started. Open air art gallery – part of the London Road Festival in 2014. Expedition – performance on London Road – commissioned by Appetite as part of the London Road Festival 2014. It’s a pretty neat trick, to take a bunch of stuff you’ve seen before, thread it together and give you a slightly different view of the world at the end. But that’s what Ian Lowey and Suzy Prince do in The Graphic Art of the Underground. The usual graphic design suspects, and plenty of familiar images, are all here. There’s Hapshash and the Coloured Coat and Family Dog’s psychedelic screenprinted posters, Jamie Reid punk graphics, Peter Saville’s hard industrial design for Factory, and Barney Bubbles riotous album sleeves, and they all deserve their places here. But Lowey and Prince thread together more diverse artists, illustrators, designers and makers to create their narrative, which starts with Von Dutch and Ed Roth customising Hot Rods and ends with Rob Ryan’s papercuts and Naomi Ryder’s embroidered illustrations. It’s that bringing together of the bright mainstream of popular culture, and of the dark corners of underground art, which make this such a strong book. That wider story finds ‘the spirit of youthful energy and rebellion’ threaded across the last 60 years, and constantly starting underground before moving to the mainstream. It’s fair to say that in almost every case, the makers – whether of custom cars, psychedelic posters, punk fanzines, street art, designer toys or indie crafts – see themselves as bold explorer’s of unknown places, largely independent of what’s gone before. But the line Lowey and Prince draw from a Von Dutch car paintjob to a Gandalf’s Garden front cover to a Barney Bubbles album sleeve to an Alex Gross painting to a Pete Fowler toy is pretty straight. It’s a captivating story, well told, and suggests that some things we’re familiar with are worth looking at again, and some things we’ve never seen are worth taking the time to investigate. If you’re interested in youth culture or underground art, graphic design or independent crafting, there’s enough in here to make this a useful (and in the future, well thumbed) addition to your bookcase. 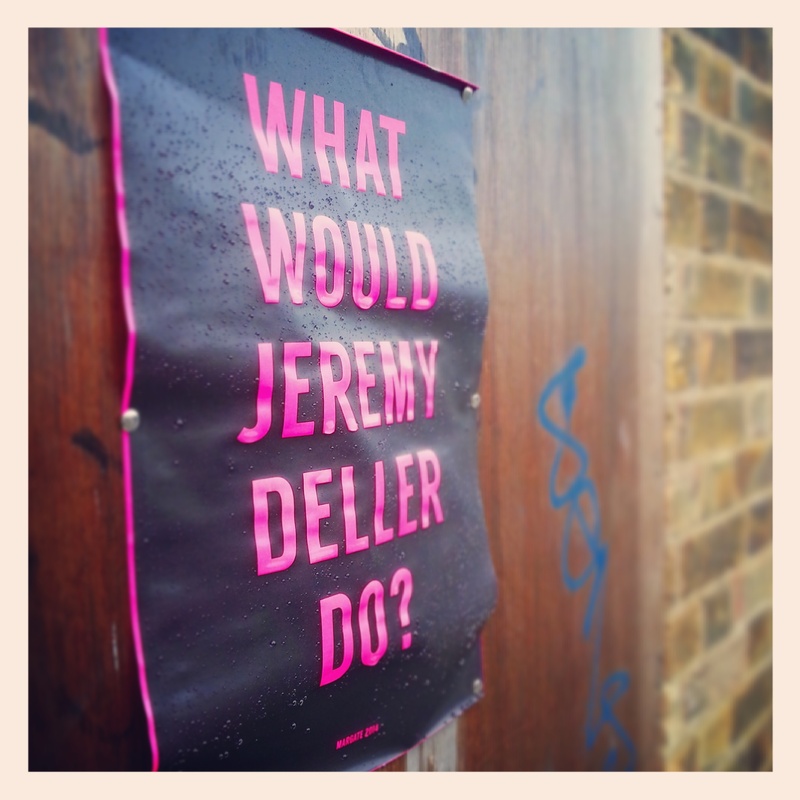 What would Jeremy Deller do? Bouffant Headbutt by Shampoo is a glorious piece of pop. It’s a snotty, sneery punk anthem – 2 minutes 11 seconds of perfect attitude. it was released in 1993 on the frankly too-cool-for-school Ice Rink label. 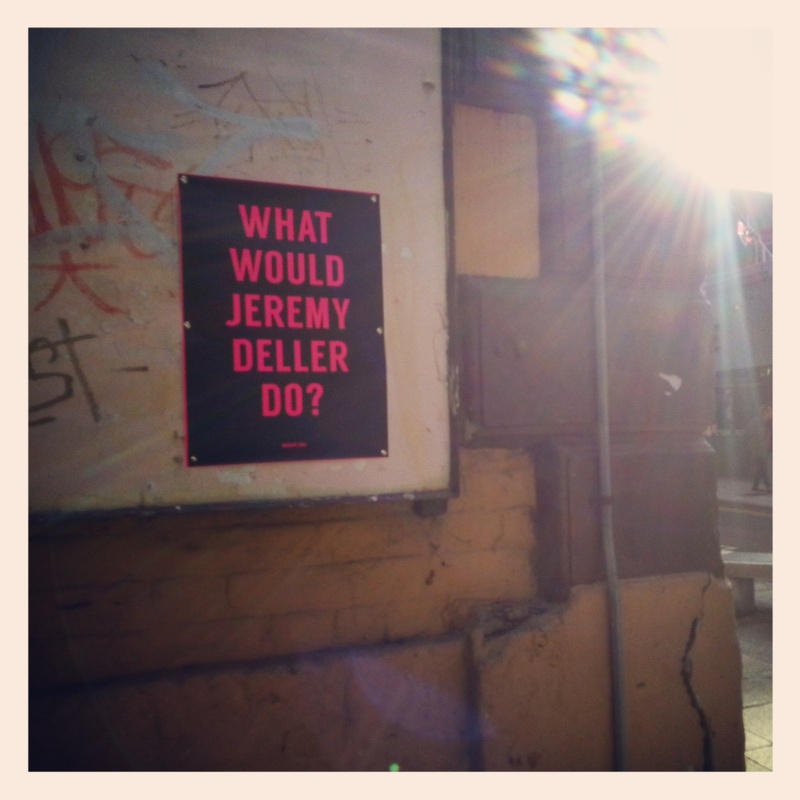 It’s also the first time I came across Jeremy Deller. He took the live photos on the single’s sleeve. He may have designed the Dolly Bird T-shirts they’re wearing; he produced designs for Covent Garden shop Sign of the Times, and a number of pop stars were caught wearing them. I’m fairly certain he was hanging around some of the same bars and clubs as me – Where’s Jude in Farringdon, Blow Up in Camden and Soho, the Good Mixer in Camden. Those were heady days; late nights, early morning trains, a buzz that wasn’t just chemically induced, a sense of urgency, excitement as the people we danced with at night made it onto Top of the Pops or into Face and i-D.
Those years in the mid-90s were reminiscent in more than just sound and style of the classic years of British pop. 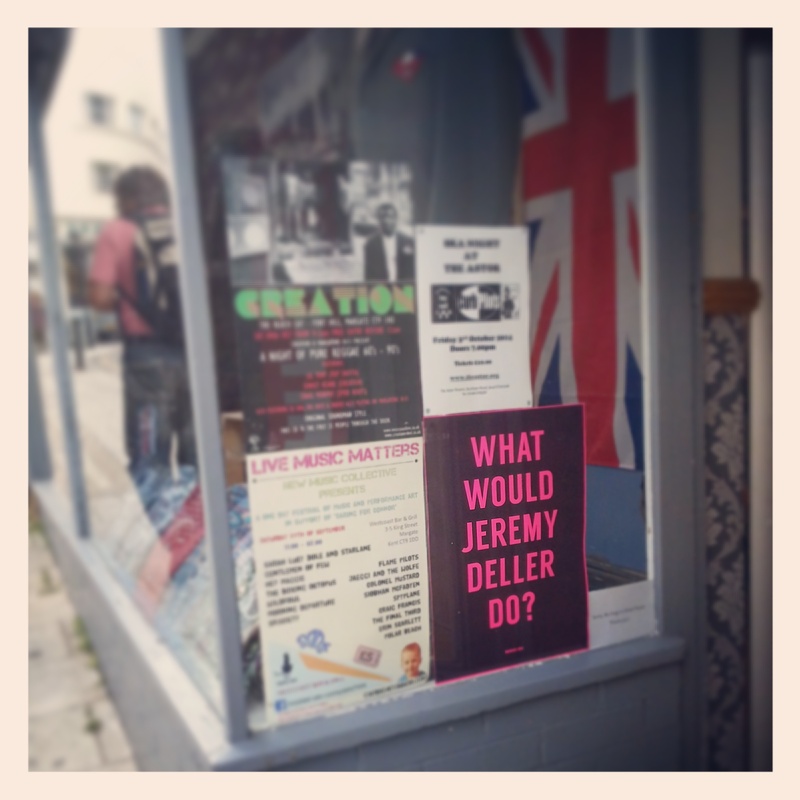 And Jeremy Deller’s always been into pop, a cultural archivist as much as an artist: Brian Epstein, David Bowie, Morrissey, Bez, brass bands playing acid house, Keith Moon and posters of Kate Moss. Shampoo – two teenage girls with attitude and pretty popstar boyfriends – fit perfectly into that tradition. They even ran the Manic Street Preachers fan club, and Deller produced The Uses of Literacy, an entire collection of work inspired by those fans. And Unconvention, an exhibition which he imagined the Manics had curated, too. Deller brought music and art together even further, producing posters imagining Keith Moon having a retrospective at the Tate, turning song lyrics into scripture, imagining the baggy scene coming to the Hayward Gallery, a poster given away at Frieze asking ‘What would Neil Young do?’. 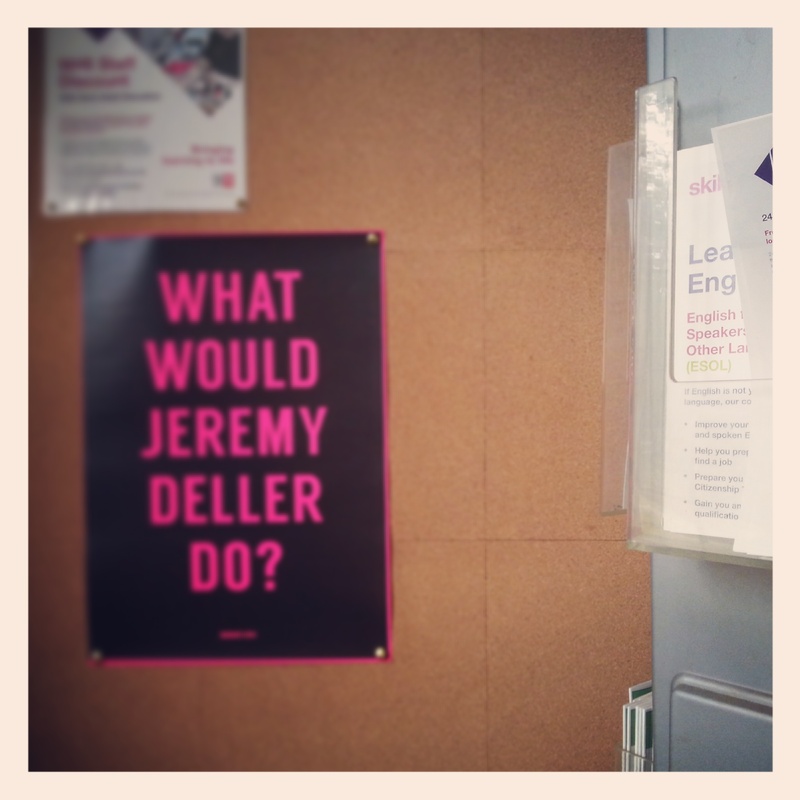 Posters and prints are a perfect pop medium, and they’re something Deller’s returned to over and over. Fast, out there in public, easy to produce, and ephemeral. They’ve been an important part of what I do, too; a minor obsession started because my first real job was producing and distributing posters for the Connaught Theatre. I’ve still got some of those; classic designs, elegant typography, ephemeral. Since then, I’ve produced posters to mark projects and actions; a set of three screenprints for Worthing Pier, a dozen designs for Bedford Happy, posters for Face Up! so good they all get nicked. 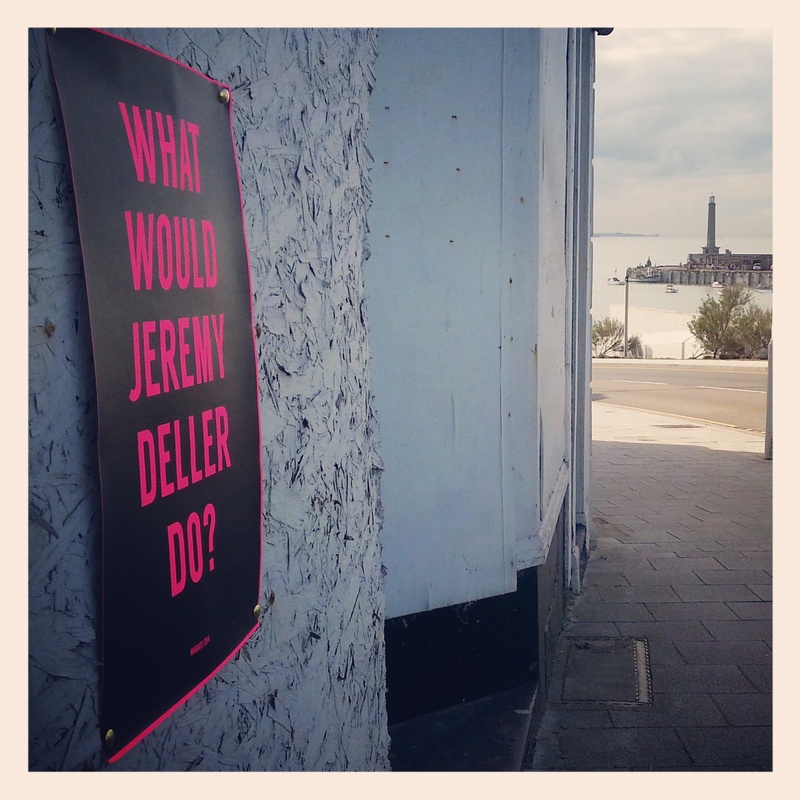 So Jeremy Deller coming to Margate feels like an interesting collision, my mid-90s life catching up with where I am today as an artist. That, and his visit, felt like something that should be marked by a poster. A limited edition, well printed, but given away and produced as a piece of public art. And nickable – it had to be nickable. Something people would steal and take home for their wall. So the two have come together in my artwork for Margate, produced as an edition of 100, printed in heavy black on dayglo paper. Drawing pinned to walls, stuck up in shops. Find one, it’s yours.